How about something a little different tonight as we are getting ready for the holidays and such. Tonight we have a bit of prose poetry (or at least an attempt at it). Chop, chop, chop, knives scrape across cutting boards. Eyes on the work and minds turned to the night ahead. The fire is lit and the beast awakens. An item slashed from the list, and then another. Prep lists diminish as service grows near. All is quiet on the line as the focus stays with just the next item on the list. Pushing, driving, chopping, and slicing till the list is gone and new things can be found to ensure we are ready. Another log is thrown on the fire. The tables fill, a couple here, a quartet there. Charged with energy, infused in nerves, strung tight like a bow. More than the calm before the storm, tables roil in the clouds of the storm to come. Another log is thrown on the fire. Orders rain down from the printer. Juices hiss and spit as meat fills the grill. Flames kiss and caress the flesh, the babe of the feast. Plates fill and dance on the line in a flurry of movement. No end to the searing flames as the orders attack and demand attention. Another log is thrown on the fire. Through the flurry of the first wave, the rhythm hits a steady beat. Words fly and meat is caressed by flames, thought lost to fluid grace, repeated. Another log is thrown on the fire. The beast cries out, demands its tribute, though without sound. It is loudest when it slips into quiet death. Feed it, poke it, cajole it back to life. The meat does not sing and cry if the beast is not happy. Another log is thrown on the fire. Only when we have lived through the worst, is the beast allowed its rest. Fed and spent, it has served its master. But the master has served the beast when another log is thrown on the fire. 4 Responses to "Feed the Beast"
Good work Jon! V. Atmospheric. Thanks. 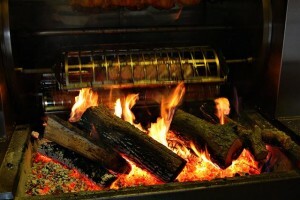 It was an effort to capture a night working a wood fired grill in a busy restaurant. I love the rhythm of this! Thanks. It is pretty much how a night on the line in a kitchen can go.